Under supervision of Prof Leunissen (WUR), Herman van den Berg (Vertis) and Koen Cuelenaere (Dalicon). 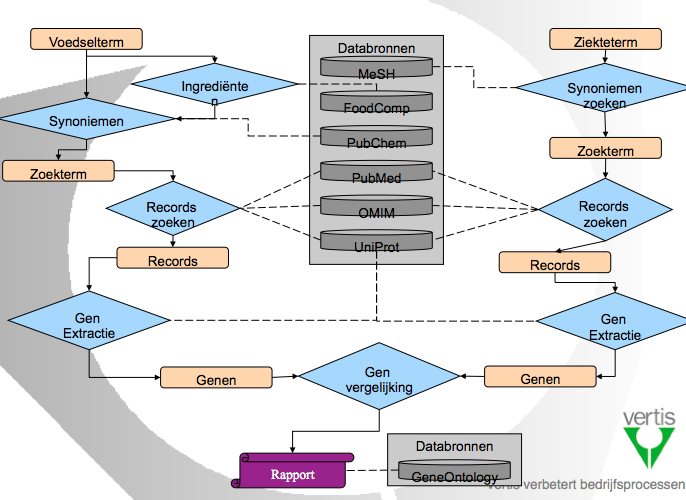 Creating a Oracle RDF based Pubmed text mining for finding relations between “health” related MESH terms and food items by using genes. Most of the work consisted of working with the latest Oracle 10g2 techniques that implemented the first version of a RDF based database. Using a RDF database you can input all your data in your database and only define the structure (as what you would normally do in a relational database like MySQL). This way the database can quickly find new ways of overlap between data over multiple layers of information (as in this kind of database there is no root nor leafs all data can be related and queried this way).